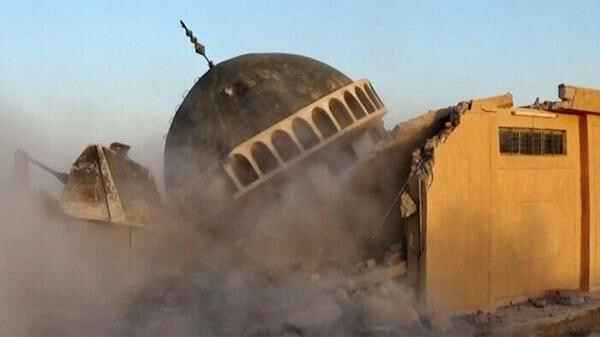 JNN 12 July 2014 Baghdad : ISIS Takfiri Terrorist who overran Mosul last month have demolished ancient shrines and Graves of the Prophets revered By Iraqi Sunni and Mosques Used by the Iraqi Shia in and around the historic northern Iraqi city, residents and social media posts said Saturday. At least two Graves of the Prophets of Islam , four shrines to Sunni Arab or Sufi figures have been demolished, while six Shiite mosques, or Husseiniyahs ( Imambargah ) , have also been destroyed, across militant-held parts of northern Nineveh province, of which Mosul is the capital. Pictures posted on the Internet by the Islamic State of Iraq and Syria (ISIS) showed the Sunni and Sufi shrines were demolished by bulldozers, while the Shiite mosques and shrines were all destroyed by explosives. Takfiri terrorists of so-called Islamic State of Iraq and Syria (ISIS) has destroyed the grave of Prophet Younus ‘Jonah’ (P.B.U.H) after getting control of some parts of Mosul Iraq. Local residents confirmed that the buildings had been destroyed and that terrorists had occupied two cathedrals as well. “We feel very sad for the demolition of these shrines, which we inherited from our fathers and grandfathers,” said Ahmed, a 51-year-old resident of Mosul. An employee at Mosul’s Chaldean cathedral said terrorists had occupied both it and the Syrian Orthodox cathedral in the city after finding them empty. They removed the crosses at the front of the buildings and replaced them with the Islamic State’s black flag, the employee said. Christians are also worried about their holy places as the ISIS insurgents destroyed the statue of the virtuous Miriam in the churches. In Iraq, there are nearly 12 ancient archaeological sites and Nineveh province has lots of archaeological landmarks, temples and other historical sites. One of the most famous is a shrine for Prophet Yunus (Jonah). ISIS-led terrorists overran Mosul last month and swiftly took control of much of the rest of Nineveh, as well as parts of four other provinces north and west of Baghdad, in an offensive that has displaced hundreds of thousands and alarmed the international community. But the Latest Scenario is that the Iraqi Forces and the Iraqi Volunteers have Jointly started an Operation Clean up in the Different Provinces and Districts and One By One they are re captured by them , and the ISIS terrorists are on the Run , even the Leader of the ISIS Abu Bakar has been severely injured in an attack by the Iraqi Air force Raid , and since then is on the Run , and there are very strong chances that he may not survive the injuries , and May succumb to his injuries. Though more recently populated mostly by Sunni Arabs, Mosul and Nineveh were also home to many Shiite Arabs as well as ethnic and religious minorities such as Kurds, Turkmen, Yazidis and other sects. This entry was posted in Iraq News, Middle East and tagged Husainiyeh, Imambargahs, Islamic State of Iraq, Mosques, Mosul, Mosul Iraq, Nineveh, Prophet Younus ‘Jonah’, Prophets of Islam, Sufi Shrines, Sunni. Bookmark the permalink.